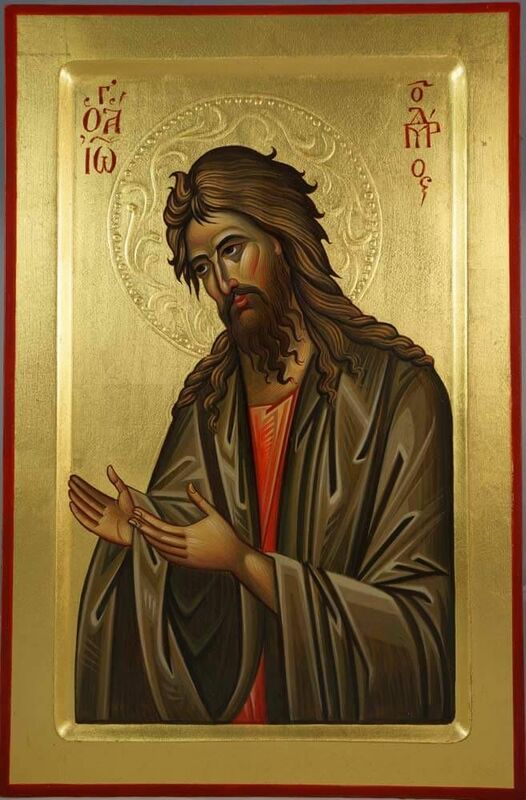 Today we celebrate the birthday of one of the most unusual and important people in the history of our faith: St. John the Baptist. He has the titles of prophet, forerunner, and baptist because he fulfilled all three roles, speaking the word of the Lord as he prepared the way for the coming of Christ, calling God’s people to repentance and baptism, and even baptizing the incarnate Son of God at the very moment when the Holy Trinity was revealed by the voice of the Father and the descent of the Holy Spirit in the form of a dove upon the Lord in the Jordan. Even before St. John was born, he pointed to Christ, leaping in the womb of St. Elizabeth at the arrival of the pregnant Theotokos, who contained within her the Savior of the world. John’s own birth was miraculous, as his parents were an old, childless Jewish couple. We’ve heard that story before with Abraham and Sarah. But even though Zacharias was a priest actually serving in the Temple when the Archangel Gabriel brought the news that Elizabeth would bear him a son, he did not believe the message. “How shall I know this? For I am an old man and my wife advanced in years,” he said. Zacharias used the exact same phrase that Abraham did in Genesis to question how he could know that God would make him the father of a multitude in the promised land. Zacharias surely knew the story of Abraham, and he should have welcomed this wonderful news with faith and joy. Instead, he doubted and was disciplined by losing the ability to speak until John was born. There had also been silence, no prophetic word from the Lord in Israel in hundreds of years, since the time of Malachi. Now Zacharias the priest has no voice. The evil King Herod was not really Jewish and ruled in collaboration with the pagan Romans. Those holding the three offices fulfilled in Christ of prophet, priest, and king were vacant, silent, or illegitimate. Now it was time for God to prepare the way for the coming of the true Messiah by means of a prophet like Elijah who would turn the hearts of the people back to the Lord. 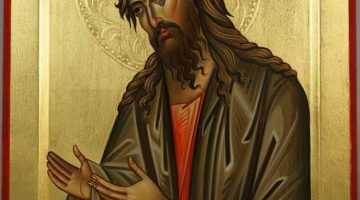 And what a prophet St. John was: An ascetic who lived in the desert, subsisted on a diet of locusts and honey, and fearlessly called religious leaders, soldiers, tax-collectors, and even King Herod to turn from their sinful ways and to live righteously. He eventually lost his head for criticizing the immorality of the royal family. It’s not surprising that one sent to prepare the way for Jesus Christ was killed by those who loved their own power more than God. St. Elizabeth hid herself for the first five months of her pregnancy until Christ was conceived, for all the events surrounding John’s birth were preparatory to the coming of the Savior. Elizabeth, filled with the Holy Spirit, spoke as a prophetess to the pregnant Theotokos even as John jumped within her: “Blessed are you among women, and blessed is the fruit of your womb…Blessed is she who believed, for there will be a fulfillment of those things which were told her from the Lord.” Zacharias himself came to believe the Archangel’s message, receiving his voice back when he wrote on a tablet to confirm that the baby should be named John, even though none of his relatives had that name. In his song of praise after the John’s birth, Zacharias blessed God for the salvation that would come in Jesus Christ in fulfillment of the original promise to Abraham. He must have had some time to ponder what he and Elizabeth had in common with Abraham and Sarah during those months when he could not speak, and he finally saw the connection. He would die a martyr when Herod’s troops could not find John to kill him in the slaughter of the innocents, when the king had all the little boys of Bethlehem and the surrounding regions murdered. Elizabeth miraculously hid herself and John in a cave from this terror; after she died forty days later, the boy grew up in the wilderness, fed by angels and protected by God. There’s certainly nothing about John the Baptist that is business as usual. Not his ministry, his conception, his parents, or what was going on around him. And that’s precisely the point we should ponder today, for God’s ways are not our ways, His salvation and blessing are not merely spiritually-charged extensions of our own habits, plans, and preferences. He calls us to a Kingdom not of this world in which barren old married women give birth to great prophets and a righteous virgin carries the Son of God in her womb. He overthrows political and religious leaders with little babies, pregnant women, and confused old men. He prepares the way for the Messiah with a prophet who lived anything but a conventional or comfortable life. The same God who worked in such outrageous ways through St. John and his parents continues to operate in our lives, our church, and our world. And He calls each of us to do what Zacharias originally failed to do: to believe and obey that salvation and blessing really are for us, that we have a unique role to play in how the Lord redeems and heals His good creation, here and now, today, in our generation. Too often, we have sold ourselves and God short. We have assumed that our faith does no more than support our prejudices and preconceived notions, and those of our society. We have rested easy with our faith making us a bit more religious and perhaps less stressed out before life’s challenges. Too rarely, however, have we taken Christ at His word to make us living icons of the Kingdom, participants in the divine nature by grace. Yes, our Savior wants to make us perfect as our Father in heaven is perfect, to make us shine like irons left in a holy fire. He wants us to forgive those who have wronged us; to love our enemies; to care for Him in the needy, miserable, and outcast; to refuse to worship the false gods of power, wealth, and pleasure; and to treat everyone who bears His image and likeness with the same love that we would show to Him. John the Baptist is a reminder that we won’t be transformed by following business as usual. We need a radical change, a spiritual rebirth, a new dependence on and openness to the power of a God who does not operate according to our preferences and agendas. Instead of coming up with the usual excuses as to why we can’t believe and live as Christ taught, it’s time to be shaken out of our complacency. It’s time to recognize that what has brought us weakness, despair, and sorrow will simply continue to make more of the same. A little bit of convenient religion on the margins of our lives may produce socially respectable people, but not those who manifest the heavenly kingdom even as they live in a corrupt world. The Jews of the first century desperately needed a wake-up call, and did they ever get one in St. John the Prophet, Forerunner, and Baptist! We still need his shocking message and witness. And even as Zacharias eventually came to his senses, we can too. The Lord wants to replace our spiritual barrenness with an abundance of new life as a sign of the salvation of the world. Let’s take Him at His word and live accordingly. That’s the best way to celebrate the birthday of St. John.